Owners, brothers and marketing gurus Steve and Scott Schmidt approached us with a business concept to target entrepreneurs in the craft brewing industry who were looking for resources to help launch their breweries into market. Their company offers marketing consulting services as well as a weekly podcast series exploring the craft beer industry, including interviews and guest appearances by industry experts. Our task was to create a brand to help bring their vision to life. They wanted a logo that communicated a level of expertise and sophistication that could help growing breweries take their business to the next level. We also wanted to convey a sense of approachability and community that bringing passionate craft brewing experts creates. In addition to the logo design execution, we wanted to help them establish their brand by creating a set of rules – the brand guidelines, that would help their own brand grow in a consistent and cohesive way as they expanded their visibility in the community. We had a pretty awesome level of partnership throughout the process and are excited to see them grow and launch their podcast series into the airwaves. Johnsonville, who was known for pre-prepared, processed meats (and sausage products in particular), was venturing into the fresh meats category for the first time with a new product launch. The Kabob product offerings are available in pre-marinaded chicken varieties, ready-to-cook on the stovetop or grill in just minutes. These fresh and flavorful kabobs are a quick and healthy option to add to lunch salads or for a main course. In a collaborate effort with Pivot and the team at Johnsonville we helped developed the new branding and packaging for the Johnsonville Kabobs product. Tasks included concept development, photoshoot Art Direction on set in Kohler, Wisconsin, photography retouching and compositing and flavor extension design and production layouts. A technique known as foil stamping has long been used as a way of elevating a printed piece – from business cards to posters and packaging. Like any other industry beer, cider, wine and spirits look for ways to celebrate a special release packaging, or elevate a cool design. As printing techniques improve, more options have become available to achieve a premium metallic feel. We’ll walk you through the differences and show some of our favorite examples. Foil is adhered directly to the label using a combination of heat and pressure. Foil can also be used in conjunction with embossing. They can be metallic, clear gloss or even special effect or patterning. Foil stamping is not only reflective but also textural in appearance. Foils are more durable and have a longer lifespan than ink. Metallic inks can be printed directly to the labels or mixed with Pantone colors to create a shimmery appearance. Because they are mixed inks, this technique offers a wide range of colors (the Pantone Matching System has over 1000 distinctive inks) and is more cost effective than foil. Inks provide a subtle metallic finish rather than being reflective like foil and is a great way to create a layered effect, rather than flashy. They are most effective for fine detail. Designs can be printed on labels or paper board that have a metallic base coat. The inks themselves will not appear metallic (although a gloss coat is typically applied for sheen), but any exposed areas will. The ability to print direct to beer cans offers a great opportunity to utilize the natural metals as part of the design. The presence of precious metals communicates luxury and achievement. Gold is associated with wealth, grandeur and prosperity. Silver is associated with industrial, sleek, high-tech and modern. Let’s be honest, people love bling. Gold and silver have, and probably always will represent our idea of “premium.” And with a range of options to achieve a metallic look, including metallic wax dipping bottles, we don’t see this trend going anywhere. Over the past year we’ve seen a pretty significant showing in the design and branding world of a technique described as mono-line or line craft. It is defined by a consistent pen stroke throughout the illustration or logo. This style, which has been a popular way of illustrating infographics is making a strong appearance in craft beer, cider and kombucha graphics. Over the past few months Deschutes Brewery has been subtly hinting at new label graphics on social media. They’re finally excited to announce that NEW packaging is hitting the shelves as we speak! All of the brewery’s bottles, cartons, and tap handles will be sporting the new, updated look which was designed to better reflect the quality of the beer inside, as well as increase shelf presence and display impact. 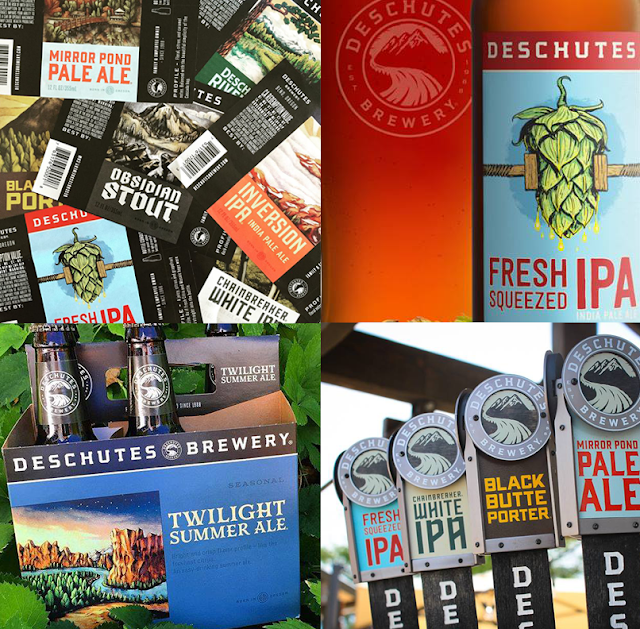 The presence of the Deschutes Brewery branding is also more prominent to help pull together a family of brands that has evolved over the past 27 years. The design change was spurred in part to help improve brand awareness and better stand out in an increasingly crowded category. 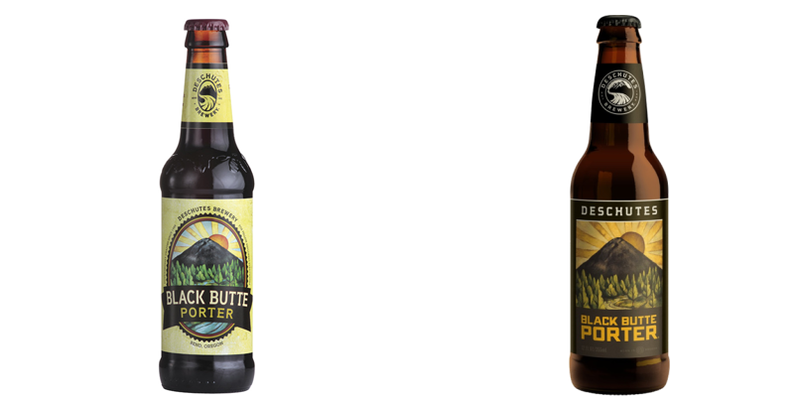 Each brand has its own unique color palette and custom typeface, with the Deschutes logo (and neck label on bottles) in black for the mainline and seasonal brands, and red for the Bond Street Series. 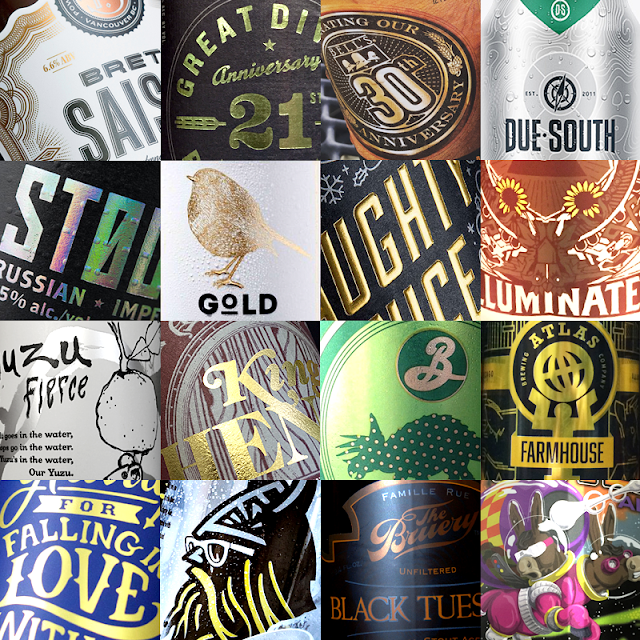 The classic illustrations associated with each brand have been retained and refined in the new design to further highlight each beer’s individuality. The round holding shape and reversed type creates more impact from a distance and is easily adaptable for multiple applications. The mountain illustration was updated to emphasize the hand drawn qualities. Watercolor-style illustrations were maintained with some warmth added to the color palette and break out of the oval shape to cover more label area. Beer names are easier to read on a straight baseline and have beer specific personality. Consistent placement of the Deschutes branding creates visual blocking and product awareness at shelf level. 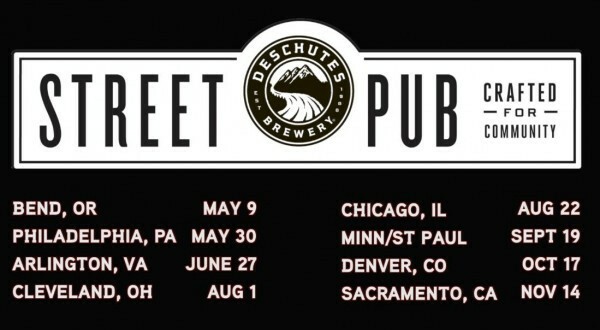 In an effort to increase brand awareness around the country, Deschutes created an “outdoor pub of epic proportions.” Their custom 400 sq.ft. portable “Street Pub” is on a 7 city tour over 7 months, with 100% of proceeds from pint sales go directly to each city’s Boys and Girls Club. In addition to the new logo and graphics, they have also launched a beautiful new website, so get on over there and check it out! I’ve recently embarked upon a new guest blog series with the passionate folks at Lakeshore Beverage, featuring an often overlooked aspect of beer – glassware. Much like beer itself, the vessels have been around for centuries and have evolved over time to accommodate beer drinker’s needs, as well as trends in the structural materials. Many books have touched on glassware, but my mission is to dive deeper into some of the world’s most popular styles, sharing their historic and aesthetic significance. Part of this exploration was creating a visual reference guide in the form of a designed infographic. To read the full story and view the graphic, check out our first post on Lakeshore Beverage’s blog.